One of the most exciting photographic talents working today, I Can Make You Feel Good is the first solo exhibition of photographer and filmmaker Tyler Mitchell. The landmark show will include a selection of beautiful images from the artist’s personal and commissioned work, while also premiering two of his films: Idyllic Space and Chasing Pink, Found Red. Mitchell made global headlines in August 2018 when he photographed Beyoncé for the cover of American Vogue, becoming the first black photographer to shoot the magazine’s cover in its 126-year history. As photography show AIPAD lands in New York this week, head to Louise Alexander Gallery where a selection of rare and unseen works by acclaimed photographer Guy Bourdin will be on show; from a selection of works from Bourdin’s seminal series for Bloomingdale’s, Sighs & Whispers, to some of the French photographer’s early work created upon first moving to New York in 1956. Over the course of his decades-long career, Bourdin shot for the most prestigious fashion publications in Paris and New York, and his highly recognisable style and recurring motifs – red lips and nails, strong silhouettes and the like – have endured well into the 21st century. Following the runaway success of Christian Marclay’s The Clock at Tate Modern earlier this year – and his collaboration with Hedi Slimane for the designer’s first Celine collection – catch some more of the London-based artist’s arresting sound and video installations in Barcelona this month. Early works and more recent iterations of Marclay’s audio and visual experiments will feature in the Spanish exhibition, as well as interactive installations that depend on audience participation, forming an exciting look at Marclay’s singular practice and engagement with music and video. Looking back to the 1980s, a new exhibition at London’s Whitechapel Gallery is tracing the city’s queer landscape. As the 50 year anniversary since the Stonewall riots approaches, Queer Spaces is a look at how London has fostered LGBTQ communities via rare archive ephemera from some of the city’s most important venues, and the manner in which such places have been forced to adapt over recent decades. 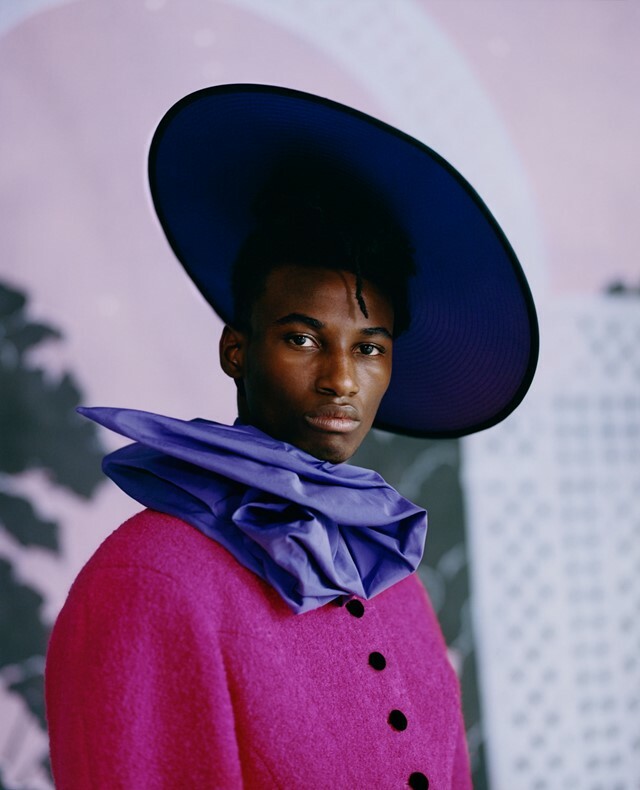 With artistic offerings from contemporary artists featured in the show, Queer Spaces promises to be an intriguing look at London’s hubs of self-expression. 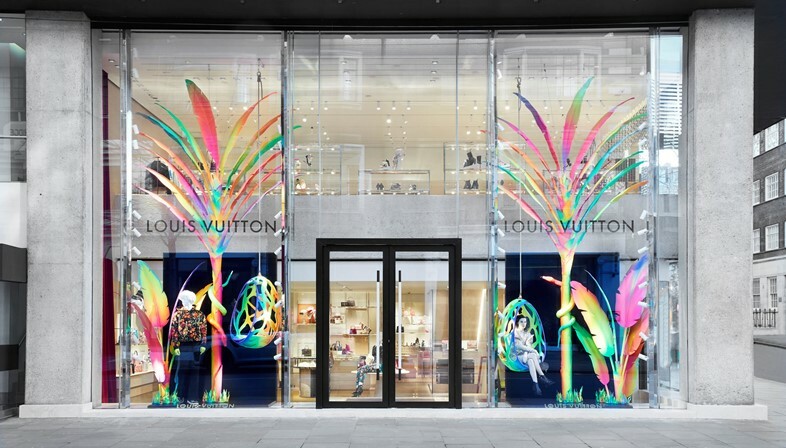 Louis Vuitton’s London flagship has reopened after a series of renovations with exciting new offerings. Set in the original Grade II listed building on Sloane Street, find the French house’s ready-to-wear and accessories as well as a host of additional services: personalise your trainers, create a bespoke gown, and customise ready-to-wear pieces, all in the company of exquisite mid-century furniture and pieces from the brand’s own Objets Nomades collection (which can also be ordered). Perfectly timed for a spring wardrobe re-stock. 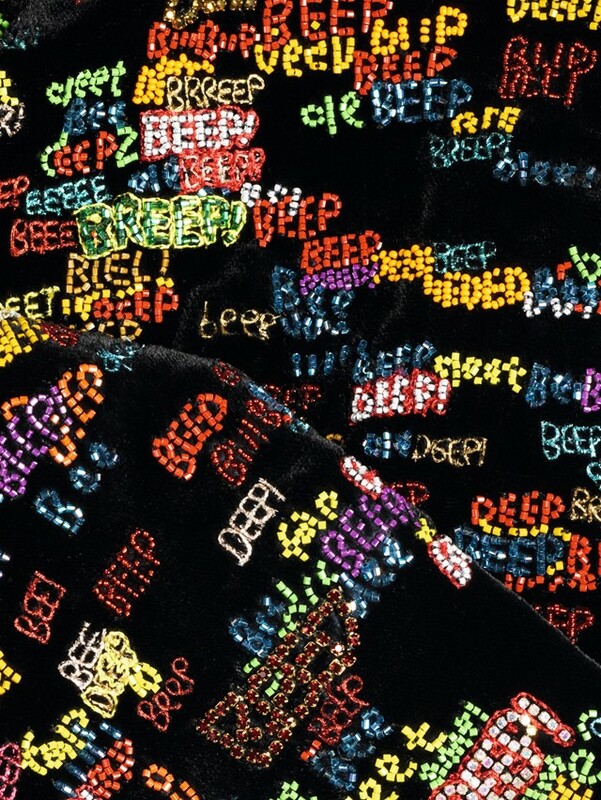 While the Fashion and Textile Museum hosts a show dedicated to the Chelsea Set and the impact of prominent members Mary Quant and Terence Conran, the V&A is placing the spotlight on Quant’s subversive designs in its own upcoming exhibition. Quant is synonymous with some of the era-defining styles of the 1960s, from miniskirts and hot pants to the decade’s notable Mod style. Emerging alongside second wave feminism, the designer engaged in rule-breaking fashion design with her high hemlines that became associated with the sexual revolution and the women’s liberation movement. The exhibition will explore the years between 1966 until 1975, with over 200 garments and accessories on display, including unseen pieces from the designer’s personal archive, alongside stories from friends and fans alike who wore her designs. 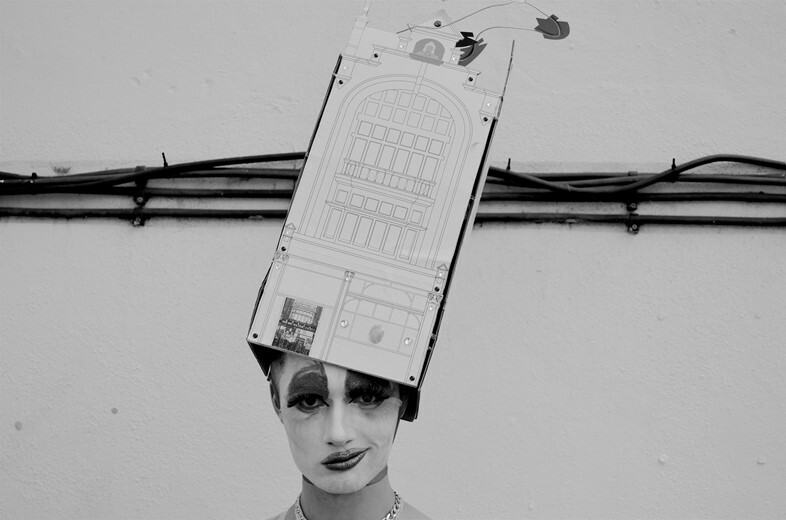 Having been exhibited at Matches Fashion’s Mayfair townhouse 5 Carlos Place in March, a series of artworks crafted by Barry Reigate and Carney’s Community members will be exhibited at Phillips Auction House this month, before being sold at auction on April 11. 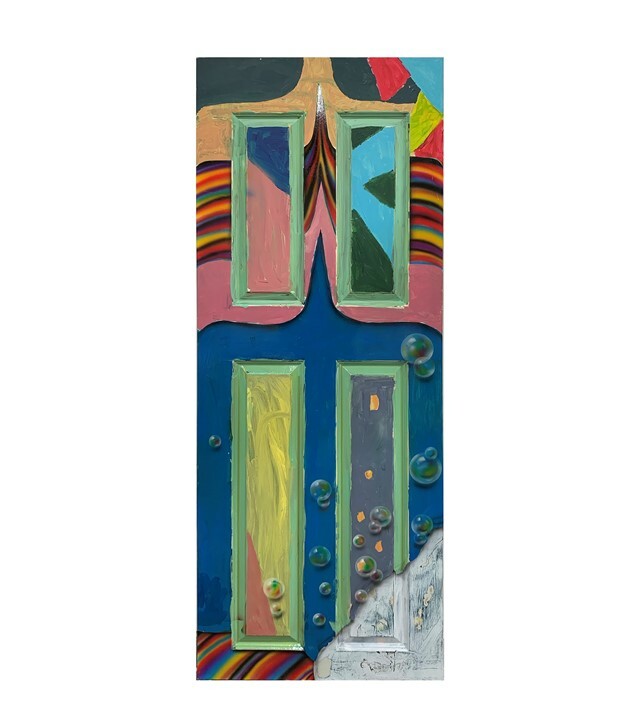 Reigate collaborated with children who benefit from Carney’s Community programme – which sees young people engage with boxing and art in order to develop skills and avoid crime – to create a series of artworks painted on doors, and proceeds from the sale of the graphic, vibrant pieces will go to furthering the charity’s vital work in London. At the end of the month, The Design Museum is offering a unique insight into Stanley Kubrick’s extraordinary archive through original props and costumes, scripts and rare photographs on display for the first time in the UK. Kubrick is frequently cited as one of the most influential filmmakers in cinematic history, having made varied films noted for their realism, dark humour, unique cinematography, extensive set design and expressive use of music. Intriguingly, there will be a chance to relive some of the iconic scenes from The Shining, Eyes Wide Shut and A Clockwork Orange. Stanley Kubrick: The Exhibition will allow us to dive into the director’s mind while taking a look into his work, following his fascination with design and architecture, which influenced all of his films. Take shelter from April’s inevitable showers with a cinema trip to see some of this month’s best new releases. 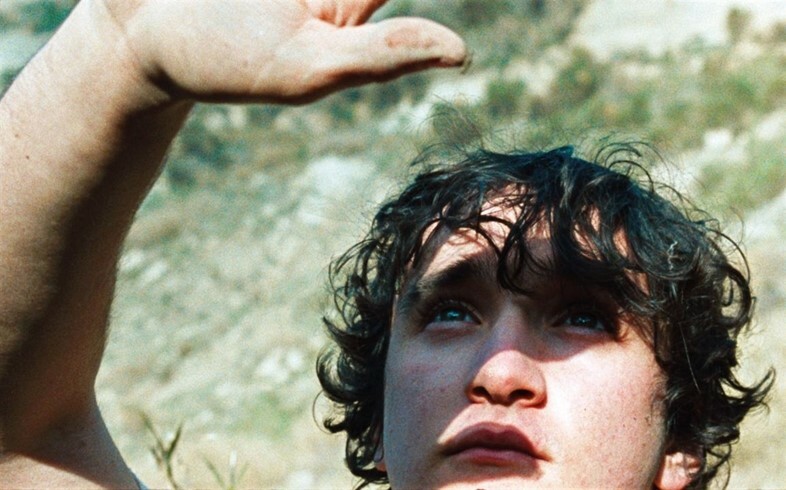 There’s Happy as Lazzaro, the mesmerising, magical-realist offering from Alice Rohrwacher about a kind-hearted peasant named Lazzaro and young nobleman, Tancredi, who forge an unlikely bond when the latter asks Lazzaro to assist him in his own kidnapping. Paolo Sorrentino returns with Loro, a brilliantly bold and brash exploration of infamous Italian prime minister Silvio Berlusconi, and the inner circle that bolstered him between 2006 and 2009, complete with all the corruption, seduction and scandal you’d expect. Another anticipated return comes courtesy of Jacques Audiard whose latest film The Sisters Brothers offers a darkly comic take on the Western set in the mid-1800s. John C. Reilly and Joaquin Phoenix star as the titular siblings, notorious assassins tasked with taking out a gold prospector accused of scamming their despotic employer. Actor Jonah Hill makes his directorial debut with Mid 90s, the wonderfully nostalgic story of a 13-year-old boy from Los Angeles whose encounter with a group of older skaters during his summer holidays offers a welcome escape from his turbulent home life. Be sure to catch Ash Is Purest White from Chinese director Jia Zhangke, a powerful and poetically rendered drama about a young dancer who falls in love with a mobster and, during a subsequent fight between rival gangs, fires a gun to protect him. What ensues is a heart-wrenching tale of unrequited love and an extraordinary exploration of China’s technological transformation during the 2000s. For remarkable true stories look no further than Yuli – The Carlos Acosta Story, Icíar Bollaín’s stunning fictional biopic of Cuban ballet legend Carlos Acosta, the first black dancer to perform some of the genre’s most iconic roles. Breaking Habits, Rob Ryan’s acclaimed documentary about a group of cannabis-farming nuns determined to deliver medicinal tinctures and salves to those in need. 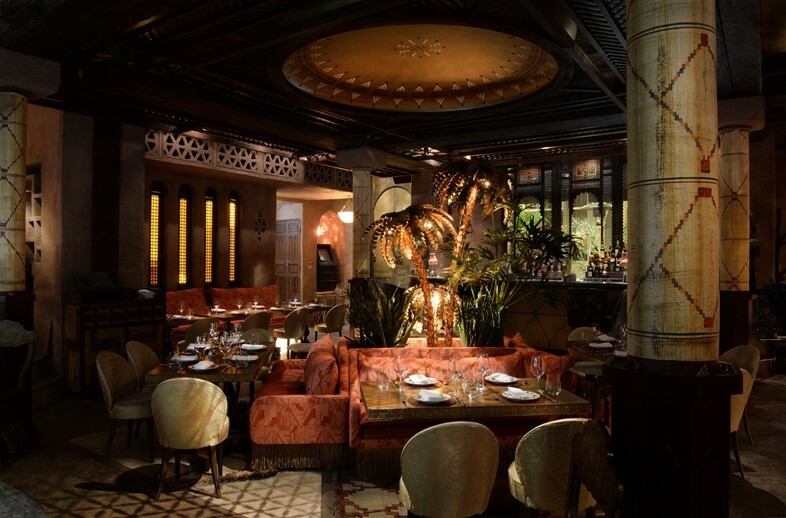 For an evening of traditional North African flavours, head to newly relaunched Momo, the brainchild of Algerian-French restaurateur Mourad Mazouz. Expect an intimate atmosphere of sofa-style seating, berber rugs, and Mediterranean specialties: revamped by chef Hervé Deville, the menu includes new dishes – octopus with salt-baked beetroot and Geuerrone sauce, or sea bream with artichokes barigoule and crab bourek – alongside some of the restaurant’s old favourites, like the Momo couscous, the 18-hour slow cooked Mechoui lamb and various tagines. A new basement cocktail bar called Kwant, led by The Savoy’s former head bartender Erik Lorincz, and Momo’s adjacent sister brasserie Mo Diner will also open later this month. While tourists flock to Japan for its renowned Sakura (cherry blossom) season, Zuma, Knightsbridge, honours the season’s most charming blooms too. Beneath a canopy of cherry blossom trees – a unique installation created by florist Moyses Stevens’ director, Ivvo Zerou – guests can sample a spring-like and pink-hued cocktail menu. 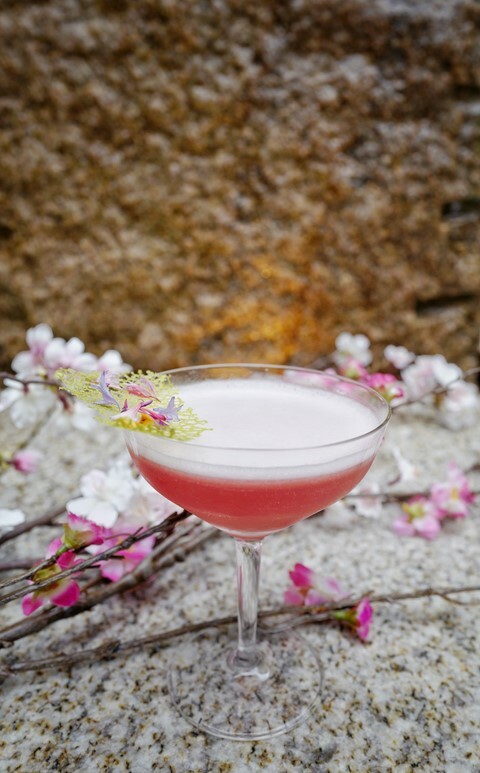 Try the Frozen Hana for its twist on plum sake or the Hanami Martini, laced with sakura honey. Fans of Flat Iron Square will be pleased to hear that Vinegar Yard, a new space from the team behind the Southwark haunt, is opening this week. 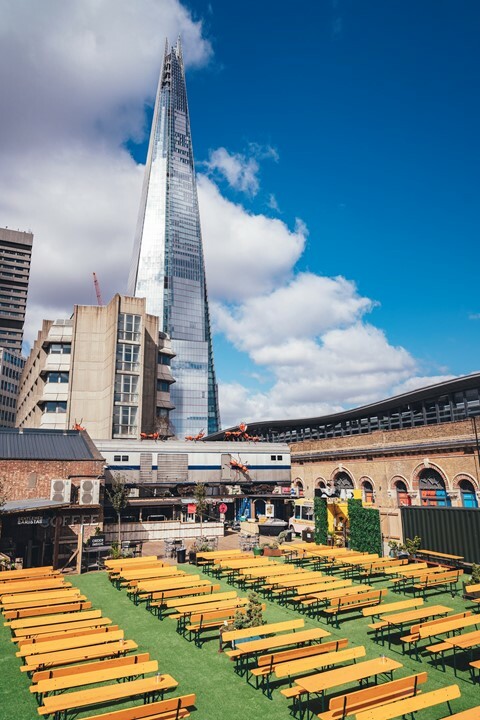 A stone’s throw from the Shard, Vinegar Yard boasts a mammoth outside space – perfect for enjoying British Summer Time’s extra hours of evening sunlight – and myriad food, drink and shopping options (think vintage clothes and furniture). There’s an abundance of excellent productions serving April entertainment. Don’t miss Three Sisters at the Almeida, Rebecca Frecknall’s take on Chekhov’s beloved tale of three Moscow-bred sisters, stuck in a provincial town after the death of their army officer father, and waiting, with increasing dissatisfaction, for their lives to begin. For musical lovers, there’s Sweet Charity at The Donmar Warehouse, starring Anne-Marie Duff as the hopelessly romantic dance hall hostess who “runs her heart like a hotel [with] men checking in and out all the time”. With choreography by Wayne McGregor and direction by Josie Rourke, in what will mark her final production as the Donmar’s Artistic Director, tickets look set to sell out fast. 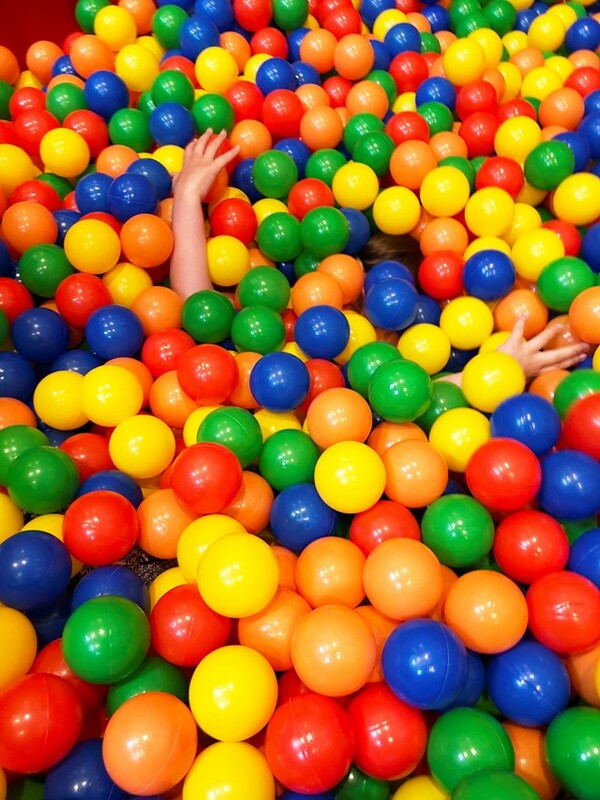 At the Royal Court, meanwhile, be sure to catch Dismantle This Room, “an experiment around ideas of power and privilege” created by director Milli Bhatia, producer Ingrid Marvin and writer Nina Sega, which will take the unique form of an immersive escape-the-room experience. This month’s best dance extravaganzas include Night of 100 Solos: A Centennial Event, a one-off global event to commemorate Merce Cunningham on what would have been the legendary American-born choreographer’s 100th birthday. Then there’s She Persisted at Sadler’s Wells, the English National Ballet’s follow-up to their lauded 2016 initiative She Said, whereby three female choreographers were invited to create pieces celebrating women in dance. Two of these have been revived for the occasion – Pina Bausch’s The Rite of Spring and Annabelle Lopez Ochoa’s Frida Kahlo biopic, Broken Wings – while Nora, a new work by Stina Quagebeur which draws on Ibsen’s The Doll’s House promises to be an exciting addition. Finally there’s INALA at the Peacock theatre, a powerful collision of South African and Western cultures set to music by the Soweto Gospel Choir, and starring dancers from Rambert and the Royal Ballet for a spellbinding combination of Zulu traditional rhythms and rousing choreography.